You will be charmed by the natural elegance of the Southern states from the harmony of this cruise and rail journey. Explore the highlights of each new port call as you cruise the Southern states & Tasmania aboard the Sea Princess. Discover panoramic views of the World Heritage-listed Blue Mountains. Explore the delights of the beautiful Hunter Valley. Enjoy the comforts of all-inclusive rail service aboard the Indian Pacific from Adelaide to Sydney. 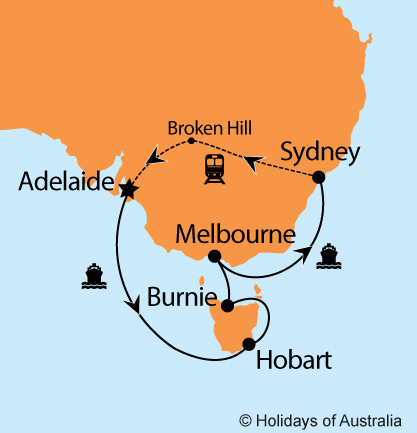 6 night cruise aboard Sea Princess cruising from Adelaide to Sydney with port calls in Hobart, Burnie and Melbourne. Includes on board meals and entertainment. Transfer from the cruise terminal to your accommodation including a half day Sydney City Sights tour. 6 night stay in Sydney at the Parkroyal Darling Harbour including breakfast. Full day Blue Mountains & Jenolan Caves tour including lunch. Full day Hunter Valley Harvest Wine Experience tour including lunch. 1 night aboard Indian Pacific travelling from Sydney to Adelaide in Gold or Platinum Service. Your journey includes all meals, drinks and off train experiences in Broken Hill. Images courtesy of GSR & Cameron Zegers Photography, Princess Cruises, Destination NSW, Stu Gibson, RA Stanley Landscape Photography, AAT Kings. *Minimum 20 passengers to guaruntee tour host.